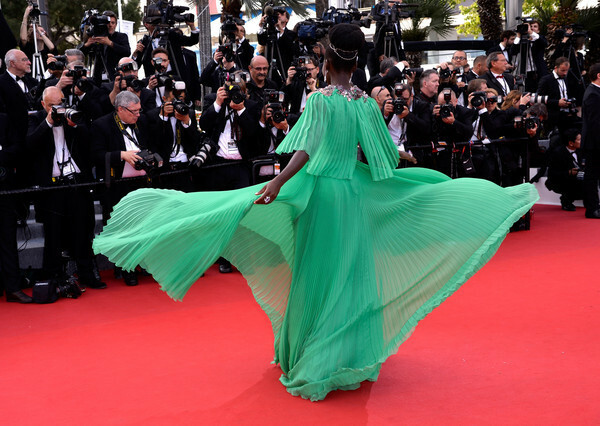 If Lupita doesn’t look like the a princess… we’re not sure what one looks like anymore. The stunning green pleated gown with a deep v-neckline was a Gucci number that was adorned with pretty floral embellishments. Lupita wore her hair in a sweet ballerina bun wrapped in a beaded headband and completed her look with a fresh glowy face and a purple-pink lipstick. Check it out as she twirls in the photos below and tell us, is she fierce or does the look fall flat?